There used to be a time when the winter months meant ever worsening cabin fever - when piscatorial pursuits were put on hold until the snow and ice made way for the first of April. 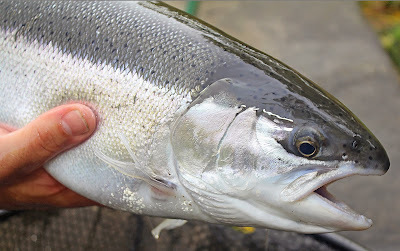 The opening day of New York's trout season was the light at the end of a dark and fishless tunnel; the weeks which preceded the opener were always filled with a flurry of activity: cleaning lines, patching waders, oiling reels, and tying flies. Opening day meant anticipation. Opening day meant hope. Then we rediscovered steelhead, and everything changed. Opening day is not the spectacle it once was. We no longer pine for the first of April because the winter months no longer hang heavy on our hearts. Rather, we look forward to the opener in much the same way we anticipate the hendricksons, sulphurs or summer drake hatch. Opening day is just one of many in a long series of opportunities. The first reports came in some six or seven weeks ago. 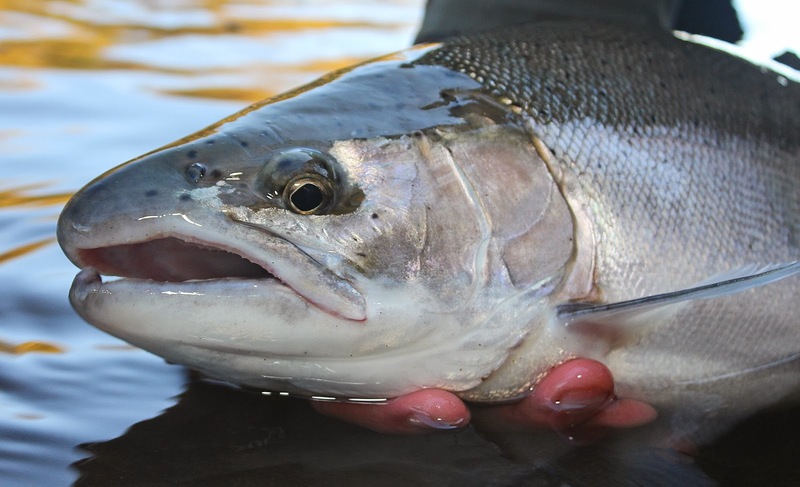 King salmon were staging in the estuary; a few had even strayed into the lower end of the river. With these early reports were whispers - hints that perhaps a trout or two had come in with the salmon, but that was late August and early September. Finding a steelhead so early in the season is akin to finding treasure in Al Capone's forgotten vault, not that we didn't try. Now it's October - a month filled with opportunity. 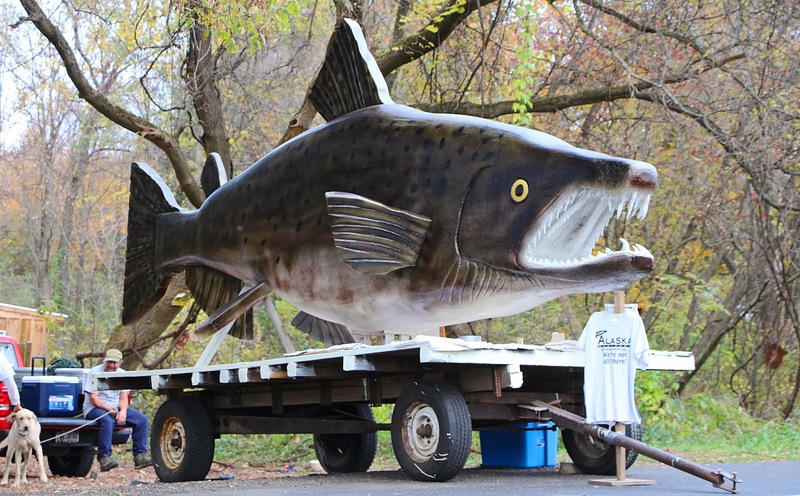 Salmon have been streaming into the system. Kings and cohos are racing upriver, but they're no longer content to travel singly or in pairs. They come with urgency and by the dozen, and what were quiet whispers of trout are now exclamations of steelhead. They're coming too - in ever increasing numbers. They know it's October. There's something truly extraordinary about October steelhead; something that gets the blood pumping in a way only skydiving, swimming with sharks, and near-fatal traffic accidents get the blood pumping. 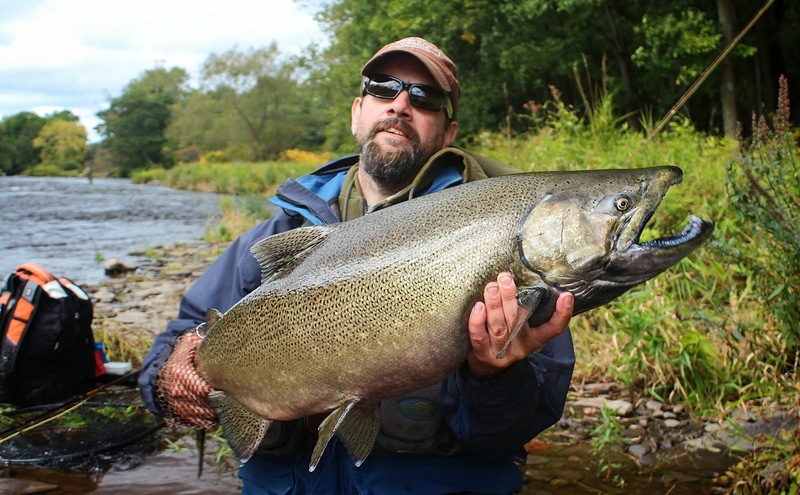 If steelhead are speed - and they are - then October steelhead are quicksilver. They're angry lightening from the heights of Olympus. They're the meth addicts of the piscatorial universe: deceptive, unpredictable, and biochemically inclined toward violence. So as I sit here typing - pining for my next trip to the river - I find myself thinking that October is the new April. I suppose it's ironic. Once upon a time, the opening day of trout season was the highlight of the year, the day to which all other days were compared. Now, it's the close of trout season that gets most of my attention. God help me, but I love October. A short while ago I received very sad news. A fly fisherman - one of the foremost amongst us - has passed. I first met Bill Cairns over a decade ago when I went to work for the Orvis company in Manchester, Vermont. At the time, Bill was still involved with the company; as the founding director of the Orvis fly fishing school, he was occasionally called upon to give casting demonstrations, lectures, or individual lessons long after his official tenure at the school had ended. To this day, I've never met anyone better able to articulate the physics of casting, identify the weaknesses of a student's cast, or demonstrate the principles he so easily explained. Bill was involved with the fly fishing industry throughout much of his life; at various times he was employed by the H.L. 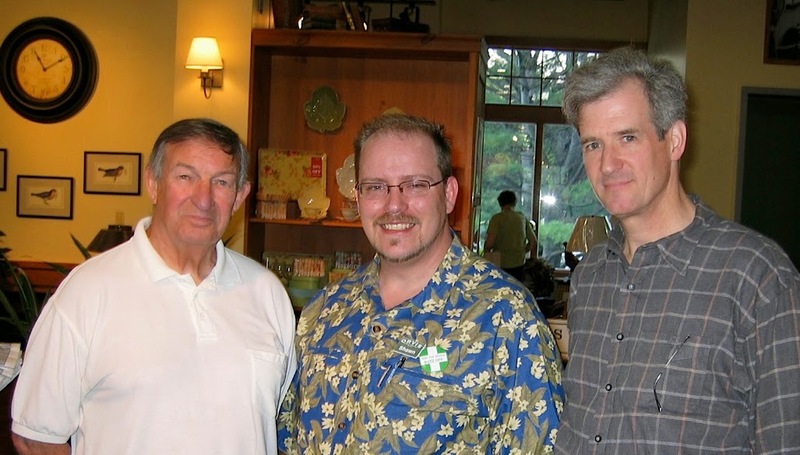 Leonard company, Thomas and Thomas and Orvis, and he served on the board of governors of the Federation of Fly Fishers. Bill Cairns was one of the finest teachers I have ever had the good fortune of meeting; being his student was a privilege. Perhaps more to the point, Bill was a fine man and a good friend. He will be missed. A memorial service for Bill will be held at 11 a.m. on Saturday the 19th of October, at Zion Episcopal Church in Manchester, Vermont. The official obituary can be found here. 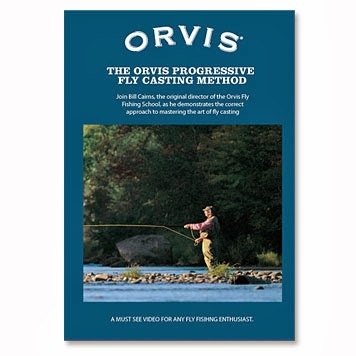 That's Bill on the cover ... this photo was often reversed in Orvis' catalogs, showing a left-handed Bill Cairns casting right handed. The 1880 House is a bed and breakfast that caters - by and large - to anglers who visit the Salmon River in New York. 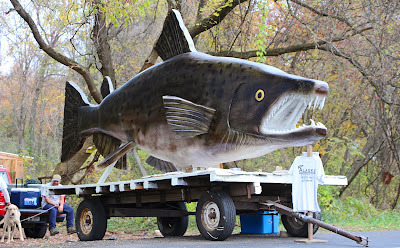 While I haven't been a guest of the 1880, I can say that the B-n-B has a reputation for being very accommodating of the anglers who choose to stay there. Unfortunately, the place was recently robbed; a safe containing the owner's personal property was taken. I realize that chances are slim the thieves will be caught - even slimmer that they would be recognized via this site - but I thought I'd do my part regardless. The video is below, and you can find the full story here.